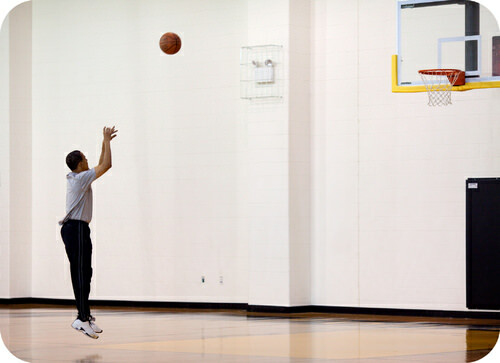 Successfully shooting a basketball requires a subconscious understanding of the vectors involved in how the basketball moves through the air. The vertical and horizontal vectors must be perfectly organized if the ball is to pass through the basket. In physics, a quantity, such as mass, length, or speed, that is completely specified by its magnitude and has no direction is called a scalar. A vector, on the other hand, is a quantity possessing both magnitude and direction. A vector quantity can be represented by an arrow-tipped line segment. 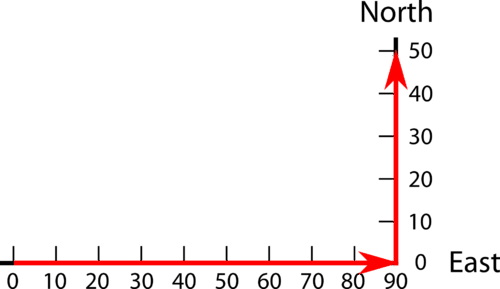 The length of the line, drawn to scale, represents the magnitude of the quantity. The direction of the arrow indicates the direction of the vector. Not only can vectors be represented graphically, but they can also be added graphically. For one dimensional vector addition, the first vector is placed on a number line with the tail of the vector on the origin. The second vector is placed with its tail exactly on the arrow head of the first vector. The sum of the two vectors is the vector that begins at the origin and ends at the arrow head of the final added vector. Consider the following two vectors. The red vector has a magnitude of 11 in the positive direction on the number line. The blue vector has a magnitude of -3 in the negative direction on the number line. In order to add these two vectors, we place one of the vectors on a number line and then the second vector is placed on the same number line such that its origin is on the arrow head of the first vector. 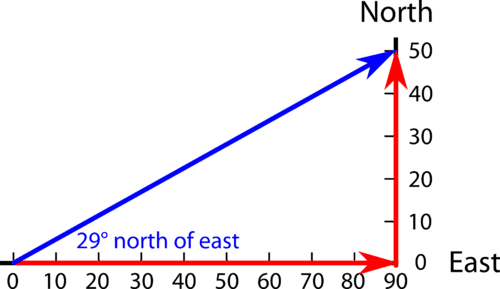 The sum of these two vectors is the vector that begins at the origin of the first vector (the red one) and ends at the arrow head of the blue vector. So the sum of these two vectors is the purple vector as shown below. The vector sum of the first two vectors is a vector that begins at the origin and has a magnitude of 8 units in the positive direction. If we were adding three or four vectors all in one dimension, we would continue to place them head to toe in sequence on the number line. The sum would be the vector that begins at the beginning of the first vector and goes to the ending of the final vector. In the following image, vectors and represent the two displacements of a person who walked 90. m east and then 50. m north. We want to add these two vectors to get the vector sum of the two movements. The graphical process for adding vectors in two dimensions is to place the tail of the second vector on the arrow head of the first vector as shown above. The sum of the two vectors is the vector that begins at the origin of the first vector and goes to the ending of the second vector, as shown below. If we are using totally graphic means of adding these vectors, the magnitude of the sum would be determined by measuring the length of the sum vector and comparing it to the original standard. We would also use a compass to measure the angle of the summation vector. If we are using calculation means, we can determine the inverse tangent of 50 units divided by 90 units and get the angle of 29° north of east. The length of the sum vector can also be determined mathematically by the Pythagorean theorem, . In this case, the length of the hypotenuse would be the square root of (8100 + 2500) or 103 units. If three or four vectors are to be added by graphical means, we would continue to place each new vector head to toe with the vectors to be added until all the vectors were in the coordinate system and then the sum vector would be the vector goes from the origin of the first vector to the arrowhead of the last vector. The magnitude and direction of the sum vector would be measured. Scalars are quantities, such as mass, length, or speed, that are completely specified by magnitude and has no direction. Vectors are quantities possessing both magnitude and direction and can be represented by an arrow; the direction of the arrow indicates the direction of the quantity and the length of the arrow is proportional to the magnitude. Vectors that are in one dimension can be added arithmetically. Vectors that are in two dimensions are added geometrically. When vectors are added graphically, graphs must be done to scale and answers are only as accurate as the graphing. Video on the graphical method of adding vectors. 1. On the following number line, add the vector 7.5 m/s and the vector -2.0 m/s. 2. On a sheet of graph paper, add a vector that is 4.0 N due east and a vector that is 3.0 N due north.